Artefact hunting is replete with Codes. The public should ask why. How come “best practice” has to be defined more than once (and how can it have multiple versions?) The answer’s clear: organisations that try to define good behaviour end up having to adopt only the standards their Members will agree to. 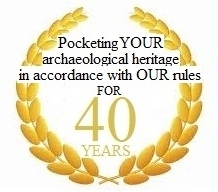 A prime example is The National Council for Metal Detecting’s code. It’s so undemanding you’d have to work really hard to breach it. You can stay fully compliant with it if you conceal 99.9% of your recordable finds from science. It’s written like that because that’s how the Members want it. Now, detecting forum UKDN has produced its own version of best practice – again reflecting their members’ wishes. To explain: you might think the obvious person to take charge of finds is the landowner – bearing in mind they’re his property and he has a verifiable name and address and is quite capable of finding his way to the local museum….. but no, says UKDN. He should only be shown the finds and then the detectorist must take them home so he can report them, honest, to his local museum or maybe at a club meeting or detecting rally (and then what? Keep, sell or take back to the farmer? Guess how often the latter has ever happened!) So UKDN’s version of Best Practice labels Farmer Literate from Leatherhead an inappropriate steward of both his own property and Society’s knowledge and says a man on a day trip who might have been called Smith or something from Stoke or somewhere is just fine. You know that’s plain wrong, Dear Reader, as does The Establishment (though it keeps quiet) as apart from being totally irrational it also opens the gate to both farmers and the public losing out in multiple ways. Why should UKDN wedge that gate wide open? Because that’s the only scenario UKDN members will accept and if UKDN’s Detecting Guide specified that detectorists should leave the finds with the owner, even for a short time, they simply wouldn’t do it. So it doesn’t. « Flag Fen: A jolly good day out!